Fallujah: The Hidden Massacre" a documentary by Sigfrido Ranucci and Maurizio Torrealta. Broadcast on the Italian state television network RAI. 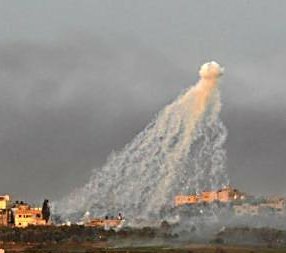 Israel used White Phosphorus against HAMAS targets in Gaza during Operation Cast Lead in January 2009. This violated no international laws or conventions. 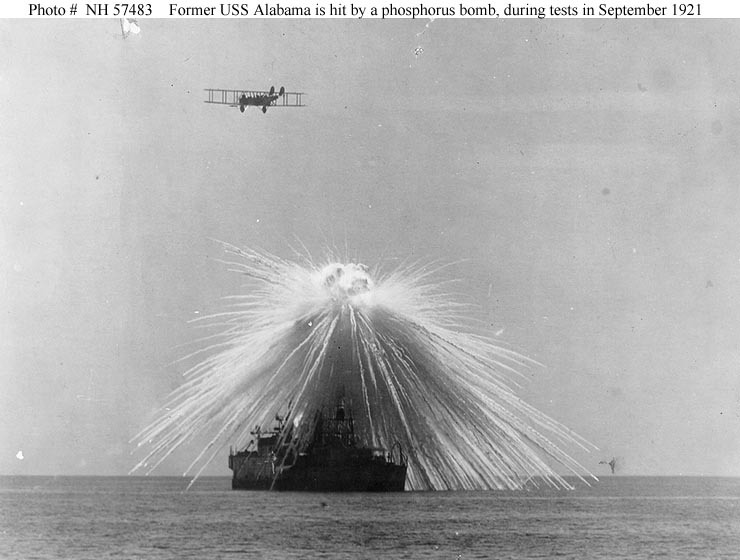 White Phosphorus (WP), known as Willy Pete, is used for signaling, screening, and incendiary purposes. White Phosphorus can be used to destroy the enemy's equipment or to limit his vision. It is used against vehicles, petroleum, oils and lubricants (POL) and ammunition storage areas, and enemy observers. WP can be used as an aid in target location and navigation. 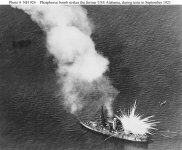 It is usually dispersed by explosive munitions. It can be fired with fuze time to obtain an airburst. 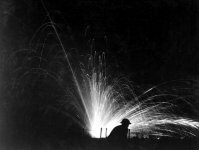 White phosphorus was used most often during World War II in military formulations for smoke screens, marker shells, incendiaries, hand grenades, smoke markers, colored flares, and tracer bullets. The Battle of Fallujah was conducted from 8 to 20 November 2004 with the last fire mission on 17 November. The battle was fought by an Army, Marine and Iraqi force of about 15,000 under the I Marine Expeditionary Force (IMEF). US forces found WP to be useful in the Battle of Fallujah. "WP proved to be an effective and versatile munition. We used it for screening missions at two breeches and, later in the fight, as a potent psychological weapon against the insurgents in trench lines and spider holes when we could not get effects on them with HE. We fired "shake and bake" missions at the insurgents, using WP to flush them out and HE to take them out. ... We used improved WP for screening missions when HC smoke would have been more effective and saved our WP for lethal missions." White phosphorus is not banned by any treaty to which the United States is a signatory. Smokes and obscurants comprise a category of materials that are not used militarily as direct chemical agents. The United States retains its ability to employ incendiaries to hold high-priority military targets at risk in a manner consistent with the principle of proportionality that governs the use of all weapons under existing law. The use of white phosphorus or fuel air explosives are not prohibited or restricted by Protocol III of the Certain Conventional Weapons Convention (CCWC), the Convention on Prohibitions or Restrictions on the Use of Certain Conventional Weapons which may be Deemed to be Excessively Injurious or to have Indiscriminate Effects, which regulates the use of "any weapon or munition which is primarily designed to set fire to objects or to cause burn injury to persons . . ."
WP is a colorless to yellow translucent wax-like substance with a pungent, garlic-like smell. The form used by the military is highly energetic (active) and ignites once it is exposed to oxygen. White phosphorus is a pyrophoric material, that is, it is spontaneously flammable). When exposed to air, it spontaneously ignites and is oxidized rapidly to phosphorus pentoxide. Such heat is produced by this reaction that the element bursts into a yellow flame and produces a dense white smoke. Phosphorus also becomes luminous in the dark, and this property is conveyed to "tracer bullets." This chemical reaction continues until either all the material is consumed or the element is deprived of oxygen. Up to 15 percent of the WP remains within the charred wedge and can reignite if the felt is crushed and the unburned WP is exposed to the atmosphere. White phosphorus results in painful chemical burn injuries. The resultant burn typically appears as a necrotic area with a yellowish color and characteristic garliclike odor. White phosphorus is highly lipid soluble and as such, is believed to have rapid dermal penetration once particles are embedded under the skin. Because of its enhanced lipid solubility, many have believed that these injuries result in delayed wound healing. This has not been well studied; therefore, all that can be stated is that white phosphorus burns represent a small subsegment of chemical burns, all of which typically result in delayed wound healing. Incandescent particles of WP may produce extensive burns. Phosphorus burns on the skin are deep and painful; a firm eschar is produced and is surrounded by vesiculation. The burns usually are multiple, deep, and variable in size. The solid in the eye produces severe injury. The particles continue to burn unless deprived of atmospheric oxygen. Contact with these particles can cause local burns. These weapons are particularly nasty because white phosphorus continues to burn until it disappears. If service members are hit by pieces of white phosphorus, it could burn right down to the bone. Burns usually are limited to areas of exposed skin (upper extremities, face). Burns frequently are second and third degree because of the rapid ignition and highly lipophilic properties of white phosphorus. If burning particles of WP strike and stick to the clothing, take off the contaminated clothing quickly before the WP burns through to the skin. Remove quickly all clothing affected by phosphorus to prevent phosphorus burning through to skin. If this is impossible, plunge skin or clothing affected by phosphorus in cold water or moisten strongly to extinguish or prevent fire. Then immediately remove affected clothing and rinse affected skin areas with cold sodium bicarbonate solution or with cold water. Moisten skin and remove visible phosphorus (preferably under water) with squared object (knife-back etc.) or tweezers. Do not touch phosphorus with fingers! Throw removed phosphorus or clothing affected by phosphorus into water or allow to burn in suitable location. Cover phosphorus burns with moist dressing and keep moist to prevent renewed inflammation. It is neccessary to dress white phosphorus-injured patients with saline-soaked dressings to prevent reignition of the phosphorus by contact with the air. Some nations recommend washing the skin with a 0.5-2.0% copper sulphate solution or a copper sulphate impregnated pad. Wounds may be rinsed with a 0.1%-0.2% copper sulphate solution, if available. Dark coloured deposits may be removed with forceps. Prevent prolonged contact of any copper sulphate preparations with the tissues by prompt, copious flushing with water or saline, as there is a definite danger of copper poisoning. It may be necessary to repeat the first aid measures to completely remove all phosphorus. White Phosphorus (WP) creates a smoke screen as it burns. 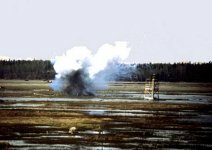 Phosphorus smokes are generated by a variety of munitions. Some of these munitions such as the M825 (155-mm round) may, on explosion, distribute particles of incompletely oxidized white phosphorus. Smokes obscure vision and are used to hide troops, equipment, and areas from detection. Smoke screens are essential for movement in city fighting. 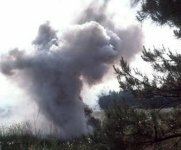 In the December 1994 battle for Grozny in Chechnya, every fourth or fifth Russian artillery or mortar round fired was a smoke or white phosphorus round. 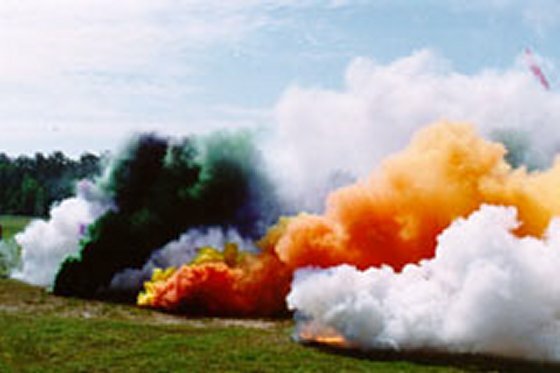 White Phosphorus and Red Phosphorus burn to produce a hygroscopic smoke containing phosphoric acids. Red phosphorus (RP) is not nearly as reactive as white phosphorus. It reacts slowly with atmospheric moisture and the smoke does not produce thermal injury, hence the smoke is less toxic. The extinction for these smokes is primarily due to scattering in the visible and absorption in the infrared (IR). These smokes are composed of spherical liquid particles that grow with relative humidity to an equilibrium size by absorbing ambient moisture that depends on the ambient relative humidity. The mass extinction varies significantly with relative humidity. The White Phosphorus flame produces a hot, dense white smoke composed of particles of phosphorus pentoxide, which are converted by moist air into phosphoric acid. This acid, depending on concentration and duration of exposure, may produce a variety of topically irritative injuries. Most smokes are not hazardous in concentrations which are useful for obscuring purposes. However, any smoke can be hazardous to health if the concentration is sufficient or if the exposure is long enough. Medical personnel should be prepared to treat potential reactions to military smokes once such smokes have been introduced to the battlefield. Exposure to heavy smoke concentrations for extended periods (particularly if near the source of emission) may cause illness or even death. Casualties from WP smoke have not occurred in combat operations. At room temperature, white phosphorus is somewhat volatile and may produce a toxic inhalational injury. In moist air, the phosphorus pentoxide produces phosphoric acid. This acid, depending on concentration and duration of exposure, may produce a variety of topically irritative injuries. Irritation of the eyes and irritation of the mucous membranes are the most commonly seen injuries. These complaints remit spontaneously with the soldier's removal from the exposure site. With intense exposures, a very explosive cough may occur, which renders gas mask adjustment difficult. There are no reported deaths resulting from exposure to phosphorus smokes. Generally, treatment of WP smoke irritation is unnecessary. Spontaneous recovery is rapid. White phosphorus fume can cause severe eye irritation with blepharospasm, photophobia, and lacrimation. Irritation of the eyes and irritation of the mucous membranes are the most commonly seen injuries. These complaints remit spontaneously with the soldier's removal from the exposure site. The WP smoke irritates the eyes and nose in moderate concentrations. With intense exposures, a very explosive cough may occur, which renders gas mask adjustment difficult. There are no reported deaths resulting from exposure to phosphorus smokes. The amazing thing is that White Phosphorus is used in almost every product imaginable - from soft drinks to toothpaste. White phosphorus is used by industry to produce phosphoric acid and other chemicals for use in fertilizers, food additives, and cleaning compounds. Small amounts of white phosphorus were used in the past in pesticides and fireworks. Bone-ash, calcium phosphate, is used to create fine chinaware and to produce mono-calcium phosphate, used in baking powder. Phosphorus is also important in the production of steels, phosphor bronze, and many other products. Trisodium phosphate is important as a cleaning agent, as a water softener, and for preventing boiler scale and corrosion of pipes and boiler tubes. The Drug Enforcement Administration (DEA), and numerous state/local law enforcement authorities throughout the United States, have noted an alarming trend involving illicit methamphetamine production. Methamphetamine (AKA speed, crank or meth) is a major drug problem in the United States. All businesses engaged in the sale of red phosphorus, white phosphorus and hypophosphorous acid products should be aware of the use of these products by clandestine methamphetamine laboratory operators. Phosphorus is an element, the name derived from the Greek "phosphoros" or light bearing, the ancient name for the planet Venus when appearing before sunrise. Brand discovered phosphorus in 1669 by preparing it from urine. Phosphorus exists in four or more allotropic forms: white (or yellow), red, and black (or violet). Ordinary phosphorus is a waxy white solid; when pure it is colorless and transparent. White phosphorus has two modifications: alpha and beta with a transition temperature at -3.8oC. It is insoluble in water, but soluble in carbon disulfide. Never found free in nature, Phosphorus is widely distributed in combination with minerals. Phosphate rock, which contains the mineral apatite, an impure tri-calcium phosphate, is an important source of the element. Large deposits are found in Russia, in Morocco, and in Florida, Tennessee, Utah, Idaho, and elsewhere. White phosphorus may be made by several methods. By one process, tri-calcium phosphate, the essential ingredient of phosphate rock, is heated in the presence of carbon and silica in an electric furnace or fuelfired furnace. Elementary phosphorus is liberated as vapor and may be collected under phosphoric acid, an important compound in making super-phosphate fertilizers. Systemic toxicity may occur if therapy is not administered. Therapy consists of topical use of a bicarbonate solution to neutralize phosphoric acids and mechanical removal and debridement of particles. A Wood's lamp in a darkened room may help to identify remaining luminescent particles. The early signs of systemic intoxication by phosphorus are abdominal pain, jaundice, and a garlic odor of the breath; prolonged intake may cause anemia, as well as cachexia and necrosis of bone, involving typically the maxilla and mandible (phossy jaw). Prolonged absorption of phosphorus causes necrosis of bones. It is a hepatotoxin. The presenting complaints of overexposed workers may be toothache and excessive salivation. There may be a dull red appearance of the oral mucosa. One or more teeth may loosen, with subsequent pain and swelling of the jaw; healing may be delayed following dental procedures such as extractions; with necrosis of bone, a sequestrum may develop with sinus tract formation. In a series of 10 cases, the shortest period of exposure to phosphorus fume (concentrations not measured) that led to bone necrosis was 10 months (two cases), and the longest period of exposure was 18 years. Signs and symptoms include irritation of the eyes and the respiratory tract; abdominal pain, nausea, and jaundice; anemia, cachexia, pain, and loosening of teeth, excessive salivation, and pain and swelling of the jaw; skin and eye burns. Phossy jaw must be differentiated from other forms of osteomyelitis. With phossy jaw, a sequestrum forms in the bone and is released from weeks to months later; the sequestra are light in weight, yellow to brown, osteoporotic, and decalcified, whereas sequestra from acute staphylococcal osteomyelitis are sharp, white spicules of bone, dense and well calcified. In acute staphylococcal osteomyelitis, the radiographic picture changes rapidly and closely follows the clinical course, but with phossy jaw the diagnosis sometimes is clinically obvious before radiological changes are discernible. It is good dental practice to take routine X-ray films of jaws, but experience indicates that necrosis can occur in the absence of any pathology that is visible on the roentgenogram.